St Mary's has a single level deck the whole way round and is designed to look like an enclosed bowl, all spectators are under cover with unrestricted sight lines. The roof is supported by a cantilever system, which will enable the ground to be extended upwards on three sides if required in the future. There is a large screen attached to the roof behind each goal. The stadium has four stands, named after the areas of Southampton they back onto. The main (east) stand is the Itchen Stand (after the River Itchen). 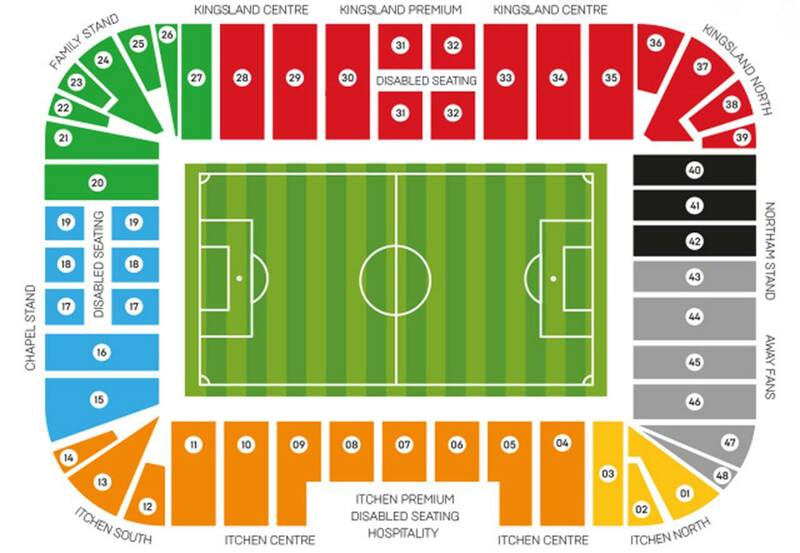 Opposite is the Kingsland Stand with the Chapel Stand behind the south goal and the Northam Stand at the other end. The Northam is the home to the more vocal supporters, as well as visiting fans. Visiting supporters are situated in the Northam stand behind one of the goals. Although segregated, you will find yourself surrounded by the more vocal and boisterous home fans sharing the same Stand or sitting in the northern end of the Itchen Stand. There are three allocations available for visiting clubs for league games – 1,800, 2,400 and 3,200. The view from any area is excellent and unobstructed and the leg room and facilities are also everything you'd expect to find at a new stadium. There are plenty of pubs and bars to choose from in the vicinity of the Stadium. Most of which get very rowdy and crowded on match days so a lot of people choose to drink in the city centre where there are the usual Yates, Hogshead and Wetherspoons outlets, as well as a Walkabout, which normally attract a mixture of home and away fans. You will also find a selection of bars, restaurants and food outlets (Burger King and KFC), which should cater for most peoples tastes. There is the odd establishment, which is either football free or does not allow sportswear. It should be noted that a lot of the bars in the City Centre which would normally welcome accompanied children in dedicated areas do not do so on match days. Parking is incredibly limited if you're an away fan. Home fans can book in advance a spot just outside the stadium for £5. However, visitors have the option of parking in the town centre which is about 15 minutes from the ground, or leaving your car at the marina which is approximately 10 minutes away. Prices are generally the same valued at £5 per vehicle and the advantage of parking at the marina allows you to escape after the game without having to endure the gridlock that can be Southampton city centre. The nearest / closest train station to Southampton's St Mary's Stadium is Southampton Central. The railway station is approximately one and a quarter miles away, which should take around 30 minutes to walk. If you want to go straight to the ground there is a free Shuttle Bus service on presentation of your match ticket or appropriate Season Ticket travel voucher, operating from Blechynden Terrace (About 150 yards turning right from the Platform 1 exit). Walking with the Civic Centre on your left-hand side, you will reach a crossroads, which bisects Above Bar Street (the main shopping area will be to your right). Continue straight ahead into New Road walking with Parks either side of you. Stay on this road across the next junction past the Solent University Buildings on your left-hand side. You will reach a complex road junction known locally as Six Dials. There are underpasses adjacent to the Premier Travel Inn, which will take you under Kingsway St. Marys into Northam Road. Follow this road for quarter of a mile until you reach the ground on your right. Travel: Myself and 4 mates jumped in the car and headed down to Southampton bright and early. We'd booked a boat(!) to stay on for the night which cost us a measly £20 each for the night. Highly reccomended as we were able to have a few beers and watch the Southampton fans arriving by ferry, all of them looking perplexed as 5 londoners in sailors hats sang songs and drank beers at 1 in the afternoon. Traffic into the city is an absolute nightmare but from where we were on the marina, it was a 20 minute walk to the stadium and then a 15 minute walk into the centre afterwards. Refreshments: We visited several pubs, but didn't spot many pubs near the ground and the ones we did were filled with Saints fans. There are absolutely tonnes of pubs in the city centre, and ample restaurants so you certainly won't go hungry or thirsty! Impressions: It's a visually impressive stadium and there can't be a bad view in the place. It's circular layout looks great, but it doesn't do much for the atmosphere. Palace sang from start to finish through a 5 goal thriller but all we got was a half enthusiastic 'When The Saints Go Marching In' in reply, and that was pretty much it for 90 minutes. Don't get me wrong, it's a stone cold classic of a football song but we probably heard that and only that about 8 times over the course of the game. St Mary's is your atypical modern stadium, but I really enjoyed it. Clean, impressive inside & out and everybody was really friendly. A couple of Southampton fans chatted to us on the walk back into town after the game and asking how we'd got there, and what we thought of the game etc. Love the fact that they come out to 'The Saints Are Coming' by the Skids too - which nobody sang along to - but was great to hear played horrendously loud in a giant stadium! Facilities: New and modern. Getting a pint was a nightmare and a definite no go which was a shame seeing as it was a swelteringly hot day. Toilets were limited so we were absolutely rammed into the bathrooms at half time. All felt a little squashed in the concourse but the seating was fine. We stood up for most of it but there seemed to be ample leg when seated. Ground staff were really friendly and helpful. Exit: Absolutely no stress when exiting. Out quickly and over the bridge on foot and into town in less than 15 minutes. Chatted to a few other fans on the way, all of whom were friendly and chatty. Enjoy: Not the greatest of away days but they play good football, in a nice town and the stadium is decent. Travel: Since Sky were kind enough to shift this game to a Monday night, I was forced to go on the coach, not exactly fun for such a long trip. The traffic getting through the city seemed to be horrendous, taking us nearly an hour to go the last 9 miles or so to the ground. Refreshments: We arrived less than an hour before kick off so not a great deal of time to look around. Didnt seem to be a lot anyway, especially judging by the number of burger vans outside the ground, which led me to think there isn't much else nearby! Impressions: Its a red Leicester (not the cheese unfortunately). That's about it. Another new ground out of town with no real characteristics about it. Acoustically at least it seemed to be better than Leicester, but that was the only real difference. Four near enough identical stands in a bowl. The concourse was fairly small as well, and for some reason only one turnstile was open and they insisted on the most vigorous search I've ever known on every single fan so it took forever to get in. Was a bit of a push getting out as well, as all of our fans were emerging from one exit, while seemingly all of the home fans had to pass it so there was quite a bottleneck just getting out. Anything Else: A show in the true nature of fickle football fans. Manager Nigel Adkins was surprisingly sacked before the game and replaced by Mauricio Pochetino who speaks no English. When our fans sang at them ‘'Wheres your Adkins gone',’ a lad next to the away end responded by proudly holding up an Argentina flag …only to hide it quickly when all around him started singing ‘'One Nigel Adkins',’ which they then followed up by singing the new manager's name! Enjoy: Not a fan, my worst kind of ground. 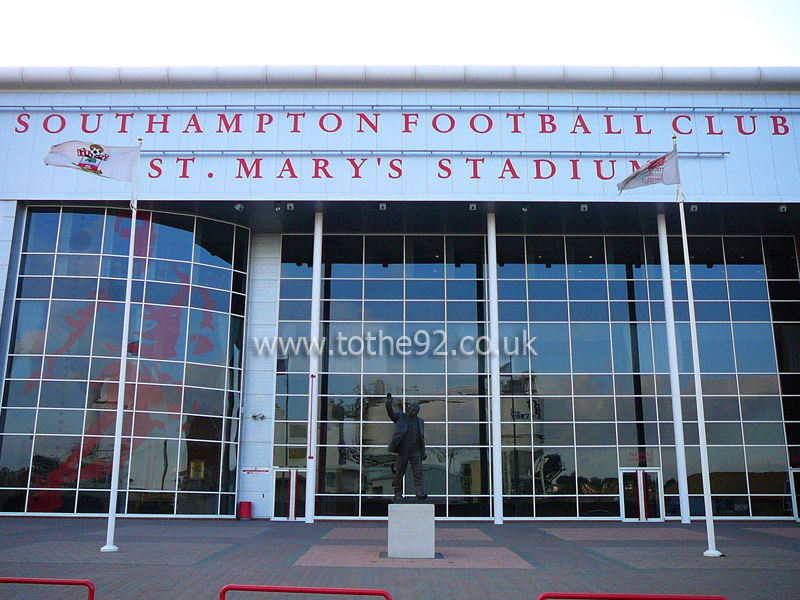 Have you been to Southampton's St Mary's Stadium? To tell us about your experiences and to feature on the site, simply complete the fans review form below!